The Farm-to-Table food movement is beneficial to the individual, community, and environment, and can be thought of as a goal or practice for the consumer to buy locally grown or raised food. And we have so many local sources for homegrown food! This can include any food such as local bakery items, produce grown from local family or sustainable farms, locally raised poultry and meat, locally made fresh cheese, dairy products and eggs, etc.--Any sort of food that can be accessed from a short distance from your home or business! The benefits of Farm-to-Table are substantial. 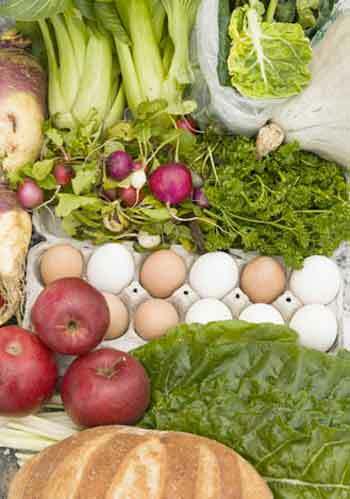 Eating local, fresh, non-processed foods presents endless nutritional and health benefits. To reduce the risk of spoiling, produce that has to be shipped from the other end of the country are often picked before they are ripe. This process takes away the opportunity for the nutrients that the plants absorb from their surroundings when they ripen on the vine and in the ground. Local and organic food is also known to be tastier, because it is so fresh! Participating in the Farm-to-Table approach is a great way to boost the local economy! Who wouldn't want to see their local businesses thrive? Too much money is spent on food that is shipped from states across the country, and even from other countries! Why not choose to buy locally? There are enough local farms, bakeries, dairy farms, and butchers to get all the food a family needs, right within the local community. Buying locally is a way to receive excellent customer service, and keep money within the community. Practicing Farm-to-Table eliminates pollution from transit, packaging, and waste. The average 18-wheeler gets roughly 5 miles to the gallon. Most produce is shipped all the way from southern states such as Florida or California, and will travel close to 1,500 miles just to reach our local grocery store. That's about 500 gallons of diesel fuel, just to deliver some strawberries that can be grown in most American backyards! Some produce is even shipped form other countries. And just think of all the plastic it takes to create the packages that produce comes in! That is not including all other categories of food such as meat and dairy products, which leave an even worse carbon footprint on the environment. Most packaging goes un-recycled and in landfills. By purchasing locally grown produce, we eliminate the need for food to be shipped across the country, reducing a significant amount of CO2 being emitted. Buying local produce also opens up the opportunity for using reusable packages, reducing the amount of packaging waste that ends up in landfills.